Last week I was having a class at my house and I needed a few card ideas so I could show the new Stampin' Up! Sale-A-Bration sets. I didn't have time to sit and ponder what to make, so I found 5 great cards on Splitcoast Stamps and CASE'd them. I just love this card so I want to give a big Shout Out to AEstamps2 for her wonderful work. I changed a few things in the interest of time, but I loved all her scalloped edges she used on her card ~ her original card was the complete package! Thanks a ton for the idea and inspiration. All Supplies Used are Stampin' Up! : Stamps ~ Birthday Whimsy, Lots of Thoughts, One of a Kind; Cardstock ~ Soft Sky, Chocolate Chip; Pattern Paper ~ Close to Cocoa & Bashful Blue Designer Series Paper; Ribbon ~ Chocolate Chip Taffeta; Scallop, Boho Flowers & Circle punches; SS Brads & Glitter. Cause this one is a bright one! Don't say I didn't warn ya! 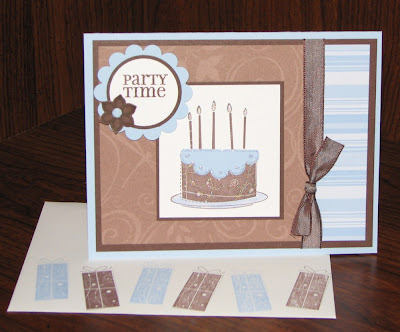 The candle that's pictured to the right is what inspired this cute little chipboard card. I love all colors and have such a good time putting together fun color combinations. This one is definately FUN! 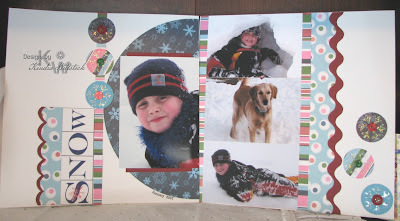 Supplies Used: Stamps ~ Lizzie Anne Designs, Cardstock ~ Bazzill; Pattern Paper ~ KI Memories; Ink ~ Versamark, Black Palette, Copic Markers; Ribbon & Ric Rac ~ Michael's; Punches ~ SU; Dies ~ Nestabilities; Brads ~ Making Memories. 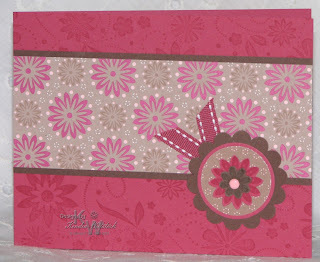 And here's another card I worked on last week for my February Lizzie Anne Designs assignment. This one all started with the giant brad in the center of the flower & the card took shape after that. 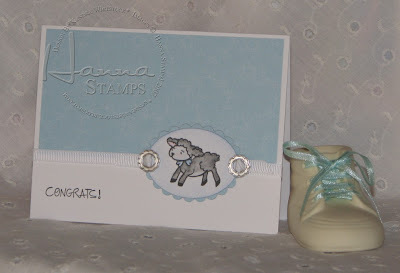 Supplies Used: Stamps ~ Lizzie Anne Designs; Ink ~ Stampin' Up! ; Cardstock ~ Papertrey & SU; Ribbon ~ SU; Embossing Plate ~ Cuttlebug; Dies ~ Nestabilities; Brad ~ Queen & Co.
Just thought I'd share a few Lizzie Anne Design projects I made a few weeks ago. 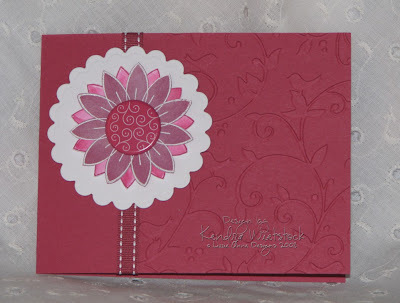 I hope I'm giving you enough eye candy to view ~ I've been a stampin' fool the past few weeks. You're gonna start seeing even more in April because I gave notice at my job. I'm super excited about having more time to create, do classes, and sell my handstamped cards and gifts. 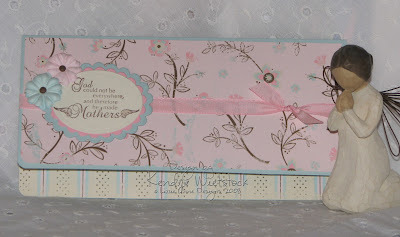 Supplies Used: Stamps ~ Lizzie Anne Designs (God Made Mothers); Cardstock ~ SU; Pattern Paper ~ Making Memories (Noteworthy); Ribbon ~ SU; Dies ~ Nestabilities; Ink ~ SU; Flowers ~ Prima. As you can probably tell, I have a major case of "Cabin Fever"! I am tired of below zero, wet, ice, snow, slush, brown grass, no leaves, no flowers, and on and on. But the thing I am tired of the most ~ feeling cold all the time. YUCK!!! I live in the wrong state. Paula ~ I have to come visit soon! 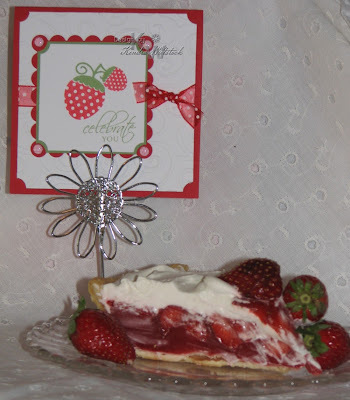 I get like this every year in February and one of the things that helps me get through it ~ is making a FRESH Strawberry Pie. It was my mom's recipe and it's super YUMMY! I always make 2 of them ~ one for our family and one for my girlfriend Jenn for her birthday ~ which is today. Happy Birthday Jenn! Eventhough I'm trying to be super good about what I eat right now, I am still going to enjoy a piece or two of this wonderful summer treat. Oh yea, the matching strawberry card was for Jenn too. So what do you do to beat the winter blues? I'd love to hear about it. Bake a pie shell and let it cool completely. 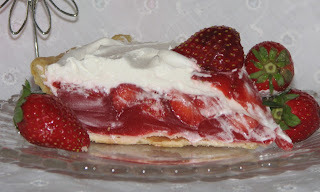 Wash and cut strawberries into bite-sized pieces & pour them into the pie shell. Set aside. In a medium sauce pan, combine Jello, water, cornstarch and sugar. Over medium heat, stir until thick. Let cool 10 minutes. Pour over strawberries and refridgerate. Once the pie is set, top with 1/2 container of Cool Whip & whole berries. ~~ ENJOY! 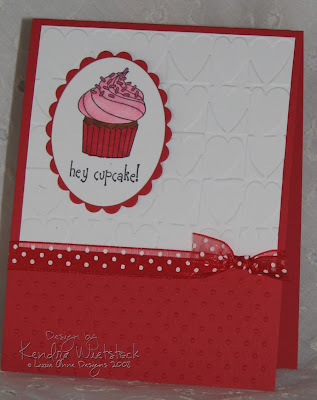 Card Supplies: Stamps ~ Papertrey Ink (strawberries) & Lizzie Anne Designs (greeting); cardstock ~ SU; Ink ~ SU; Embossing Plate ~ Cuttlebug; Brads ~ Queen & Co.; Dies ~ Nestabilities; Ribbon ~ May Arts. Well here is my last sneak peek for the new Hanna Stamps sets. This is the main image for the Route 66 set. 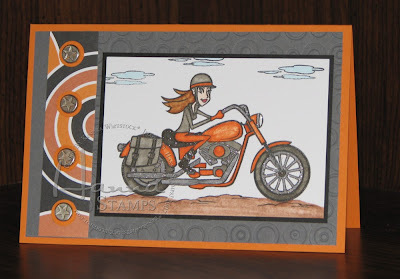 I am not a motorcycle chick, but this was a fun card to make. Supplies Used: Stamps ~ Hanna Stamps (Route 66); Cardstock & Pattern Paper ~ SU; Ink ~ Palette Black & Copics; Embossing Plate ~ Cuttlebug; Star Brads ~ SU. I saw the lamb in this set and immediately thought about making a baby card. Once again, this image is from the new Hanna Stamps set that is available tonight at midnight. Supplies Used: Stamps ~ Hanna Stamps (Spring Time); Paper ~ Papertrey White, K& Co. (pattern); Dies ~ Nestabilities; Ribbon Slides ~ SU; Ink ~ Palette Black, Copics, SU Watercolor Wonder Crayons; Ribbon ~ SU. I'm trying so hard to feel the warmth in all my spring cards, but I'm still shivering! I know that some warm weather and sunshine will be here soon ~ right? Anyway, here is the main image of the new Spring Time set by Hanna Stamps. Hanna and the bunny are actually 2 separate images. One of my favorite things about the Hanna images is how easy it is to paper piece her clothes. 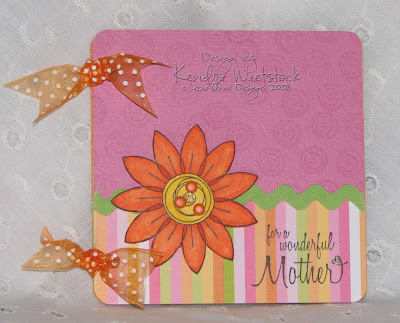 Just stamp your image on pattern paper, cut it out and attach it to the image you stamped on white cardstock. Easy Peasy! 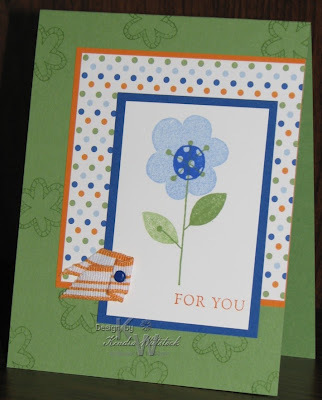 Supplies Used: Stamps ~ Hanna Stamps (Spring Time); Cardstock ~ Stampin' Up! ; Pattern Paper & Flower embellishment ~ K & Co.; Ink ~ Palette Black & Copics; Ribbon ~ May Arts. I can't wait for spring. It is so darn cold here and I'm tired of not being able to feel my fingers! This cute little bunny just makes me feel all warm and happy though. 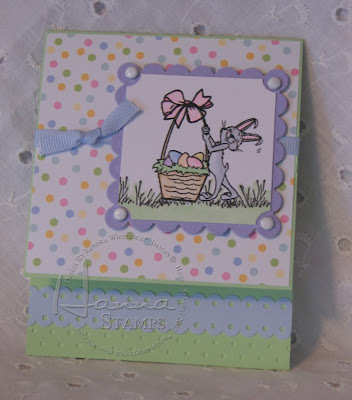 It's my favorite image in the new Spring Time set by Hanna Stamps. It will be available this Friday, February 22nd. Supplies Used: Stamps ~ Hanna Stamps (Spring Time); Ink ~ Palette Black & Copics; Paper ~ Stampin' Up! ; Pattern Paper ~ Doodlebug Easter; Trim ~ Doodlebug; Embossing Plate ~ Cuddlebug (Swiss Dot); Ribbon ~ Stampin' Up! ; Brads ~ Queen & Co.; Dies ~ Nestabilities. Can't you just hear that song playing now? I'm sure some of you are to young to remember the old Jackson Brown song. Ever since I made this card Friday night, I can't get it out of my head. These stamps are from the new set by Hanna Stamps called Route 66. The set will be released this Friday, February 22nd. This isn't the main image of the set, but it was the first idea I had ~ so that's what I made. I'll have a few more samples to show you in the next few days. Go to Insert>Picture>Word Art. Select the half-circle shape with simple black letters (the third shape in the top row). In the box, shoose your font and size, then type your text and click OK. Click on your words to select them, and the Word Art tool bar will appear. Click the WordArt Shape button, and choose Circle (Curve) from the menu. The words will be all messed up. Click on your text again to select it, and go to Format>WordArt. Click the Size tab and enter the height and width (set them the same for a circle). I used 1.2" x 1.2" so I it would fit inside the punch I was using. Click the Colors and Lines tab. Under Fill, select a color for your type. Under Line, select No Line. Then click OK. (I found this tip in Simple Scrapbooks Magazine). 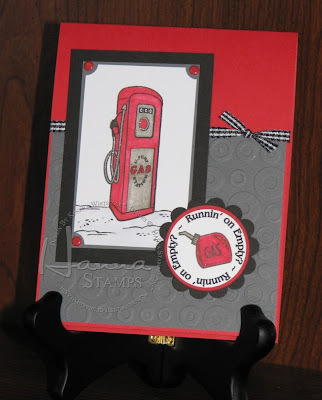 Supplies Used: Stamps ~ Hanna Stamps (Route 66); Paper ~ Stampin' Up! 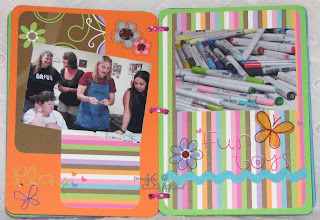 ; Ink ~ Palette Black, Copic Markers; Embossing Plate ~ Cuttlebug; Punches, Brads and Ribbon ~ Stampin' Up!. I'm having a class this week and thought I'd give a little peek at what we'll be up to. The girls will make 8 cards with matching envelopes in these two designs. Supplies Used are all Stampin' Up! ETA: The picture of the second card is bugging me! The pattern paper is really straight, but the angle of the photo makes it look all wonky! I hope you all have a wonderful day with the people you love! 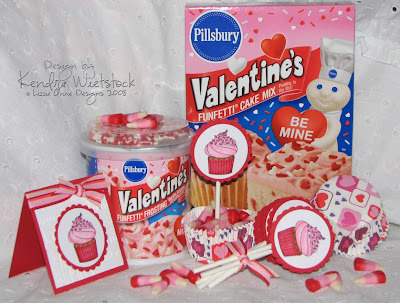 Supplies Used: Stamps ~ Lizzie Anne Designs (Cupcake); Ink ~ Palette Black & Copic Markers; Embossing Plates ~ Cuttlebug (Swiss Dot & Block Hearts ~ on the card; Swirls on the tag); Punches (tag) ~ Marvy; Dies (card) ~ Nestabilities; Ribbon ~ May Arts. 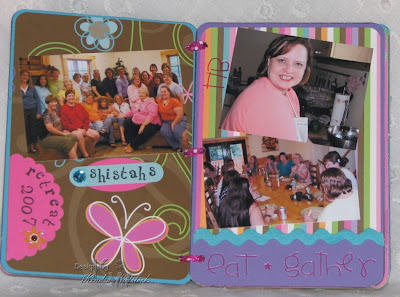 Well these are the last few pictures of my little chipboard book. This was such a blast to make! I can't begin to tell you how much I love my friends ~ they are so special. 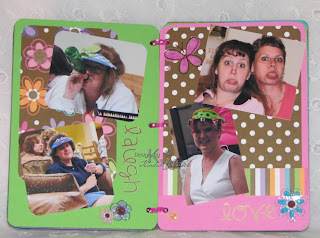 All Supplies are by Doodlebug Designs. Oh my goodness! I almost forgot to post more pages today ~ what was I thinking? Anyway, here are too more pages that make me happy. Miss Lana Sue Who, aka My Quiet Time Buddy, just constantly makes me laugh & smile. Every now and then, I will have to pick up this little book to get me through the next several months until our next retreat in August ~ CAN'T WAIT! I cannot believe how many people I talked to today that asked me, "When are you going to post more pictures of that cute little book?". Wow ~ people really do read my blog! This is totally cracking me up! I told you I would post more and here are 4 more pages. Gotta leave something fun for tomorrow and the next day ya know. Outside of vacations with my family, these retreats with my girlfriends are THE BEST trips EVER! I've never laughed so much or been that sleep deprived in my life! I don't usually have an eye for trash; however, I went out to eat with my family a few months ago and saw these coasters on the table. I immediately stuffed 6 of them into my purse because I knew I could make something pretty cool with them. My husband just looked at me and rolled his eyes, but knew that I was excited about something. He stopped asking questions a long time ago. In fact when something comes up missing around the house, he usually assumes it's in my studio. He teases me because I never iron or sew unless it's for a papercrafting project. Good thing he likes to have a good laugh ~ even if it is at my expense. I guess it's a small price to pay for a supportive husband. Stay tuned in the days ahead to see the pages of My Crazy Friends book! 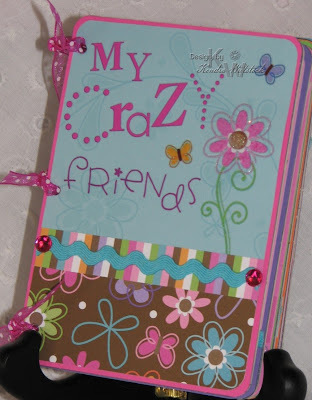 Supplies Used: Doodlebug ~ paper, rub-on flowers, rub-on alphabets, ric-rac, brads, and jewels. Thanks Miss Cami! My sweet friend and fellow blogger awarded me with an Excellent Blogger Award! How nice is that? So now I have the difficult task of naming just 10 Excelllent blogs that I love to visit! So I decided that I would name blogs I love to visit that haven't been given an "E Award". I found these ADORABLE frog cupcake papers by Wilton. 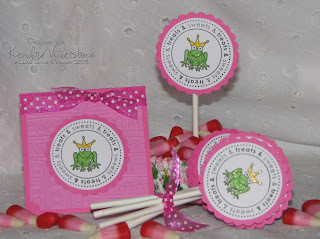 That meant that I had to make some lolly pop sticks using the cute little frog from Once Upon A Time set (Lizzie Anne Designs). I just love when I find something in the store that I have a stamp to match. I get totally excited about it & then I have to make a billion of them. So guess what I've been doing in all my "spare" time ~ yes coloring cupcakes and frogs! I have enough supplies right now for 5 kits, just thought of someone else I'd like one for and now my kids are wondering why they don't have one. So I guess I'll be running back to Target for the cake mix & frosting tomorrow! 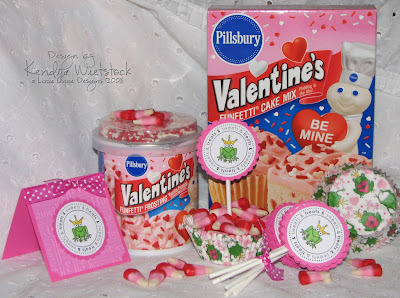 I am SOOOOOOOOOOOOO excited about these adorable little cupcake kits!!! My wonderful friend Michelle Wooderson made these for Christmas & I couldn't wait to try them too. I originally wanted to make some for Christmas as well, but time just didn't allow. 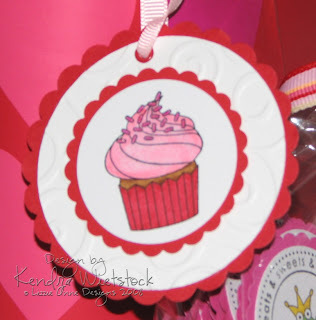 Then Lizzie Anne Designs came out with this adorable cupcake stamp and I knew I just had to do this kit for Valentine's Day! Thank you Mish for your constant inspiration and your permission to CASE the idea ~ YOU ROCK GIRLFRIEND!!! OH ~ and did you know they made CUPID CORN? How fun is that?!!!? 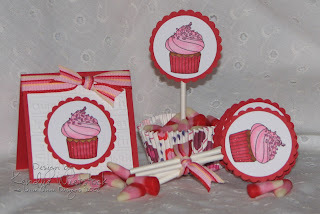 Supplies Used: Stamps ~ Hey Cupcake Single (Lizzie Anne Designs); Ink ~ Black Palette & Copic Markers; Punches ~ Marvy; Ribbon ~ May Arts; Embossing Plate ~ Cuttlebug; Cupcake papers & lollypop sticks ~ Wilton. Wooohooo! I spent yesterday and today working on this project and got it done! I'm not only happy with the end result, but I bought all the supplies less than a month ago and now it's done. I don't know about you, but I will see something in the store and just have to have it for a special project. Months (or even years) down the road, nothing gets done on the project. So this feels really good. So which project(s) are you going to get out that have been sitting around for months or years? Find something that will get you going and make that craft item that you have had on your "To Do" list & just Get it Done! 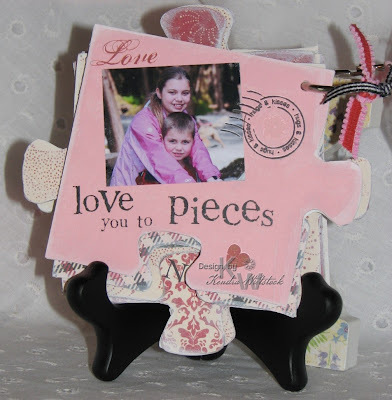 Supplies Used: Chipboard Puzzle Pieces ~ Unknown; Paper, Chipboard Letters, Rub-ons, & stickers ~ Making Memories Love Story Collection; paint ~ white acrylic paint; Ribbon ~ Misc. I wish I would do this more often! 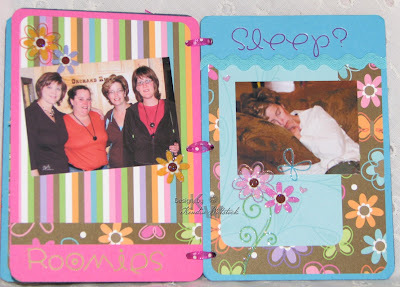 "I LOVE scrapbooking ~ why don't I just do it more?" This is the question I ask myself every time I finish a layout. 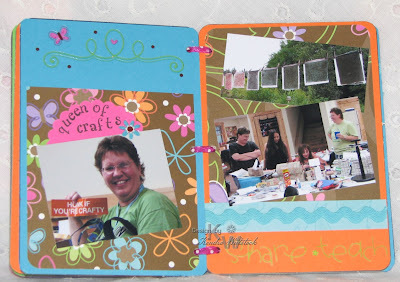 Scrapbooking is how I started this wonderful paper crafting hobby. I bought this layout as a kit when I was in Las Vegas last month while visiting a friend. So it was easy peasy to just slap together ~ Gotta love that even more! My challenge to you this week ~ get some pictures out & do something fun with them. 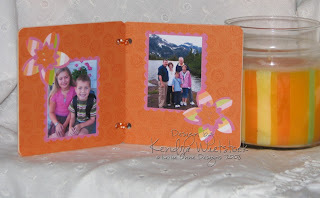 How about a layout, a mini scrapbook, or maybe even a card with a photo on it? I've got another fun Valentine project that involves photos of the people I love. I'm working it right now & can't wait to share it with you ~ I hope to finish that up today. Here is the final installment of the Once Upon A Time Story. This is a super fun set & I hope I showed you some things that would inspire you with it. I was thrilled that in the 5 projects I made, I was able to use all of the images in the stamp set. Enjoy! 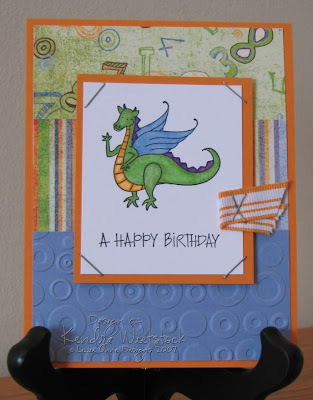 Supplies Used: Stamps ~ Lizzie Anne Designs (Once Upon A Time & Happy Birthday); Cardstock ~ Stampin' Up! 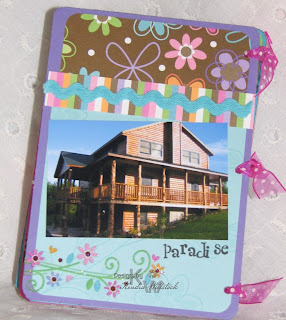 ; Pattern Paper ~Heidi Grace; Dies/Punches ~ Nestabilities & Stampin' Up! ; Ink ~ Palette Black & Copics; Ribbon ~ May Arts; Jewels ~ K & Co.
...to protect the Princess from Dragons! And now we have Chapter 4 of our Once Upon A Time Story. 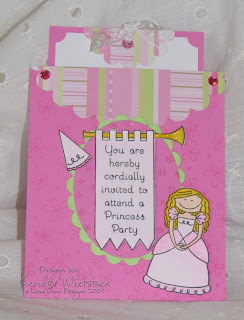 Let me tell you, I was so excited to make a boy card out of a princess set ~ you just get so much more for your money! I was searching around the internet the other day and found this cool site called Card Positioning Systems. Each week they have a new card sketch and several ideas to go along with it. It's a great place to find a little inspiration when you are totally blocked! 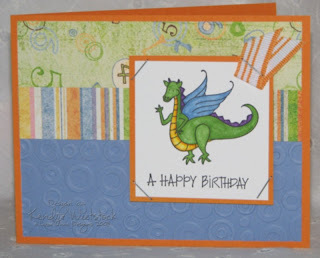 That's where I found the card layout for this dragon card & then I decided to make it both directions ~ way fun! 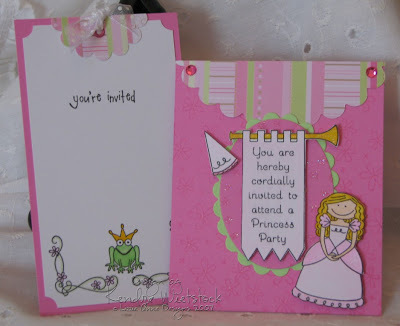 Supplies Used: Stamps ~ Lizzie Anne Designs (Once Upon A Time, Sketched Sentiments); Cardstock ~ Stampin' Up! ; Paper ~ Basic Grey; Ink ~ Palette Black & Copic Markers; Embossing Plate ~ Cuttlebug; Ribbon ~ Stampin' Up! ; Staples.